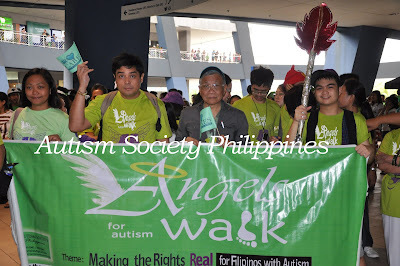 “Making the Rights Real for Filipinos with Autism” is the theme of the 6th Angels Walk for Autism. The walk kicked off the 16th National Autism Consciousness Week celebration, spearheaded every year by Autism Society Philippines in partnership with different public and private organizations. The successful walk-for-a-cause attracts not only persons with autism and their families, but also education and health professionals, members of the business sector, government officials, members of civil society groups and organizations, students, advocates and dedicated supporters. Angels Talk invited two perennial angel walkers to share with us their private journals why they walk for autism every year. 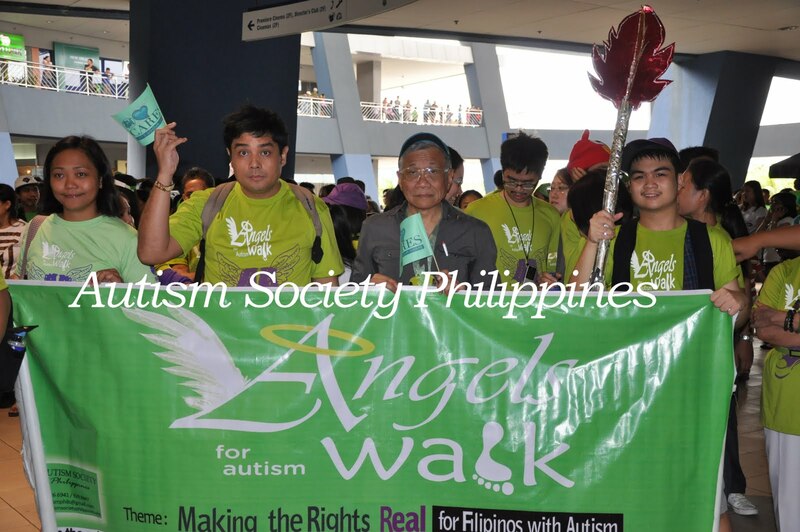 “The “Angels Walk for Autism” is an occasion for people to see children and adolescents with autism in a new light. Some common misconceptions about autism include believing that autism is a psychological disorder thus labelling them as crazy or psychotic. Modern researches reveal that autism is not a mental health disorder but a biological condition. Some people used to believe that persons with autism cannot socialize. It is important to note that the extent of difficulties in social interaction vary from one person to another. Moreover, it is not true that persons with autism are useless as they may take on responsibilities and even assume adult roles. Some persons with autism are integrated in the community and are capable of establishing relationships in school or in the workplace. As Ms. Dang Koe, Chair Emeritus of the Autism Society of the Philippines, mentioned in an interview, persons with autism do not need our pity and sympathy; instead, they deserve to be respected and accorded with equal rights and opportunities. After walking around the mall grounds, a Talent Show participated in by performers with autism showcased their talents through song and dance numbers. Once again, the ASP Dream Girls Nica and Thara wowed everyone with their song numbers. Our own Matt, Eion, Paco and Cornell collectively known as “The ILLC Hunks,” danced to the bouncy beat of Jennifer Lopez' “Papi.” The Hunks' performance was a hit with the crowd who clapped and cheered them on as they showed off their moves. Students with autism from other schools displayed their talents through various performances. It was an eye-opener for some of the people watching who approached us saying that they could not believe the boys' had autism for they danced so well. Teacher KismetteCepe of the De La Salle Medical Center’sNeurodevelopmental Center is not just an angel walker. She has not only attended all past six Angels Walks, but hosted the walk’s program and talent show for the last four years. Here are excerpts from her Angels Walk memoir. “My knowledge of autism prior to the first time I joined the first Angels Walk in 2007 was limited to what I read on books and magazines. A far cry from what I would eventually experience in my six-years of “walking with the Angels”. 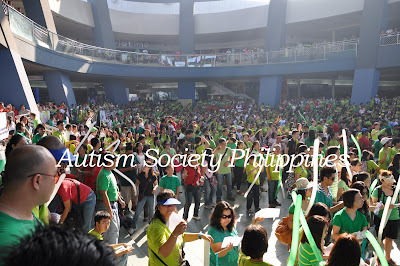 As a first time participant then, I was very inspired to see children with autism walking side by side with other children, parents and therapists – more than two thousand of them.I remember carrying one side of the banner of our delegation (ASP Cavite chapters) with the other side handled by Paul, with autism. I would often remind Paul to slow down as he got too excited walking, making us walk fast to keep up with his pace. In 2008, the venue was set at the Quezon City Circle. Like other ASP Cavite Chapter members, I remember waking up at 3:00 am so I can make it to the event.It was the first time that I was able to appreciate the program because the venue was big enough for the crowd of more than 3,000. The audience went wild when the ILLC Hunks performed. Seriously, they were all very handsome bunch of dancing teeners making it hard to believe that they have autism. Angels Walk found its permanent heaven in SM Mall of Asia starting 2009. Personally, I never thought that SM management would open its doors (with their spacious venue) to Autism Society Philippines. Before, it was really difficult for children with autism and their families to enjoy the mall because not all people are familiar with the ways on how to handle special customers. Unlike people with visual and/or physical disabilities, people with autism would not be easy to detect based on mere physical appearance. Their atypical behaviour can also misled the uninformed that these children are just typical mallers with ‘bad’ mall behaviour, so to speak. SM’s Committee on Disability Affairs, the mall was able to launch programs that opened the eyes of its tenants, frontliners, managers and even their customers on how to handle people with disabilities. It was really a revolutionary move on their part as facilities were restructured and people were trained by professionals just to accommodate people with disabilities in their malls. Every year, as angel walkers grew in number, so is my sphere of influence. I brought my mother, cousins and relatives in 2009, my colleagues from Neurodevelopmental Center in 2010, and my fiancée in 2011. My family was overwhelmed with the experience, while my fiancée was teary-eyed seeing supportive families walking with personalized tarps for their children with autism. The evolution of performers with autism is also noteworthy. From single or duet performers on stage, the song and dance numbers that we had this 2012 made it appear as if one is watching a variety show on television. First-time participants would be so surprised to realize that all those performers have autism. Before only those based in Manila would be performing but now, more ‘discoveries’ are showcased by children from other areas of Luzon as well. I do believe that people with disabilities in general and people with autism in particular, have rights like us that must be respected: rights to health, education, labor and social welfare. But our belief must be translated to action. Joining the walk makes me ‘walk the talk’. Total acceptance of people with autism in our community may be a daunting task that can take several years if not decades to pursue but we have to start somewhere.